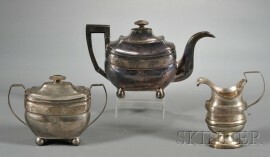 Assembled Three-piece Silver and Silver-plate Tea Set, John Wolfe Forbes and William Garret Forbes, New York City, early 19th century, comprising, similar in form and decoration, a teapot and covered sugar, with bulbous oblong bodies with applied rim bands with engraved flowering vine and diamond diaper decoration, the sides with "MM" monogrammed wreaths, supported on ball feet; the teapot with hinged lid, angled hardwood handle, and S-curved spout, marked "W.G. FORBES" in a rectangle on base; the sugar bowl with applied angled strap handle, marked "I.W. FORBES" in a rectangle on base; a silver-plated creamer with rim band of stars in circles, applied medial band with flowering vine, strap handle with leafy vines, unmarked, (imperfections), ht. 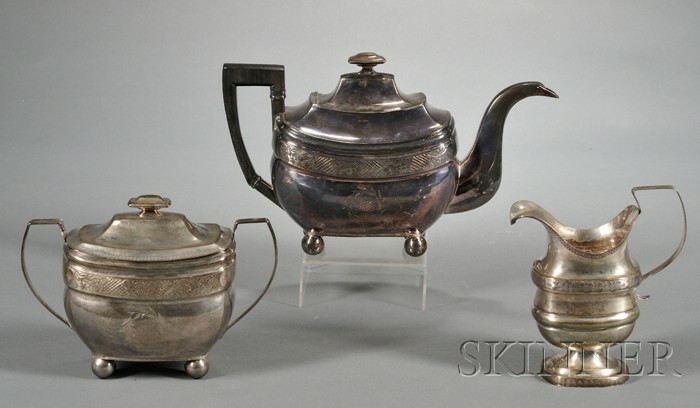 6-7 3/8 in., teapot and sugar bowls approx. 35 troy oz. (with teapot handle).